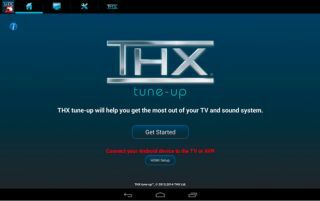 THX launches Android version of smartphone and tablet 'tune-up' app | What Hi-Fi? THX has announced the long-awaited launch of its mobile 'tune-up' app for Android devices, which is now available in the Google Play store and comes nearly a year after we reported the release of the iOS version. If you're the owner of an Android device (a compatible one, that is), you'll now be able to adjust your TV, projector and speakers in order to fully optimise your home entertainment system for the best picture and sound performance. THX says both the Android and iOS version of the app will be available free worldwide until February 3rd, before it reverts to its original price of $1.99 – around £1.20 in UK prices. Using custom-made video patterns and audio tests, the 'tune-up' app will allow you to see your video equipment's settings, as well as checking if separate speakers are connected and working properly. For TVs, the THX tune-up app uses the built-in camera of the device and a specially-designed colour filter to help you adjust the colour and tint settings on your set and to make sure skin tones appear natural. Bonus cinema features also feature as part of the app, including THX Deep Note – the sound THX is renowned for can be activated in 5.1 surround sound. Meanwhile, the Ask Tex feature lets you submit your questions to THX. The app is available now for the HTC One, HTC One Max, HTC One X, HTC One X+, Nexus 4, Nexus 5, Nexus 7-2013, Nexus 10, Samsung Galaxy S4 and Galaxy Note 3, as well as Android devices with OS version 4.2.2 or later. To connect your Android phone or tablet to your TV, projector or AV receiver, you'll need a HDMI cable and a HDMI adapter compatible with your specific device.